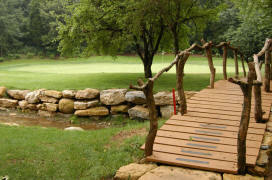 Caddie's Summary: Persimmon Ridge is talked of as the most challenging course in the state of Kentucky. We unfortunately photographed Persimmon after a week of heavy rain and hot days, and the course still played and looked like a championship venue. With the greens rolling 10-12, the play is treacherous at best, as the heavily sloping putting surfaces are the most difficult in the tri-state. Tight fairways call for precision, and the golfer must be on top of his/her game on approach shots to avoid ravines, bunkers and water hazards that tightly guard many of the holes. 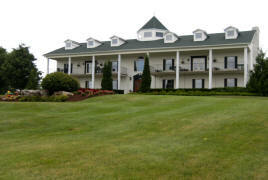 The course is mature and the facilities hold the esteem and character of a warm golfing tradition. The tips (Gold tees) are a difficult treat for any serious golfer and provide a test on each and every shot. 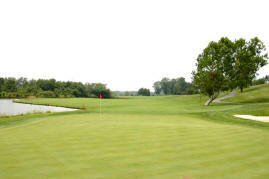 Many of the holes (such as the Par 5 #3) require decision making from the tee box for the entire hole's play. Once again, the green's are a formidable challenge and the course is among the best conditioned in the region. We encourage golfers to do their best to play this great course.